When the Dalai Lama arrived at the Madison Masonic Center in Madison, Wisconsin on March 8, 2016, a small group of Tibetans with flags and placards were waiting quietly to welcome him. 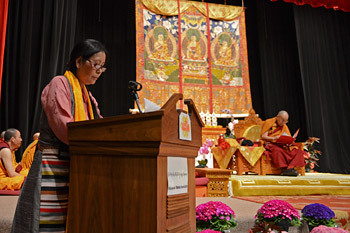 He was met as he stepped out of his car by President of the Wisconsin Tibetan Association (WTA), Tsetan Dolkar, about 1,050 people, including 700 Tibetans, were gathered to listen to him speak inside the Masonic Temple. Sharpa Tulku moderated the occasion and first introduced children of the WTA who cheerfully sang a song of gratitude to the Dalai Lama. Amdo Yeshi Gyamtso read a report summarizing the activities of the Association. In her introduction, Tsetan Dolkar spoke particularly about students’ achievements in a wide range of studies up to and including PhD. She noted the Dalai Lama’s advice that compassion is essential for our survival as human beings. She expressed thanks to everyone who had contributed to making the occasion possible. Local Congressman Mark Pocan stepped forward to offer the Dalai Lama a traditional white silk scarf, and Dane County Executive Joe Parisi introduced the Dalai Lama to the audience. The Dalai Lama’s three major commitments to the promotion of human values: (1) to ensure human happiness; (2) harmony among religious traditions and (3) preservation of Tibetan Buddhist culture. 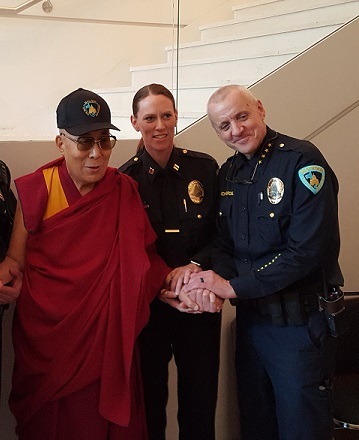 Executive Parisi said that as a mark of support, the Tibetan flag is flying alongside the Stars and Stripes over the Dane County Executive Building for the duration of the Dalai Lama’s visit. “Indeed, it is a great honor for me to have the opportunity to meet all of you Tibetans and friends of Tibetans here. We’ve been in exile now nearly 57 years, but wherever we are local people have been friendly and supportive. Here, too, the local administration and friends have shown us genuine warm feelings, as well as support for our just cause. Thank you. “I am glad to hear that our community here has a sense of responsibility both as Tibetans and as local citizens. In Tibet people still face great difficulties, which is why it is important that we preserve our identity. This is not just a matter of how we look, but of knowing our own language, how to use it and the significant body of knowledge, the Nalanda tradition, it is capable of expressing. In the past, only monastics, not laypeople, really studied these things. This needs to change. Already nuns have taken up the study of classic texts and several of them will shortly be awarded Geshe degrees. The Dalai Lama said that whenever he meets other people he considers himself to be just one among 7 billion human beings. He said that on that level there are no differences between us, whether you think of nationality, faith or whether people are rich or poor, educated or uneducated. He remarked that we are all born the same way, and brought up in the shelter of our mother’s affection. This is why all 7 billion human beings have the same potential to cultivate warm heartedness. Equally, scientific findings that constant anger, fear and hatred undermine our immune system applies. It’s common sense, he continued, that families where love and affection thrive are happy even when they are poor, but families, who, despite their wealth, are riven with jealousy and suspicion are miserable. The Dalai Lama said the prospect of humanity being more peaceful depends on individuals being peaceful within. He affirmed that because of our brains we are capable of thinking ahead and planning for the future. Through education and awareness we can cultivate physical health and a calm mind. He said we need to cultivate compassion, yet modern education tends to focus on material development rather than fostering inner values. This is why it’s important to find ways to incorporate ethics and human values into our education, something the Dalai Lama said he is committed to support. He explained that as a Buddhist monk his second major commitment, at a time when the unthinkable is happening and people are killing each other in the name of religion, is to promoting religious harmony. He said this is possible because the common aim of all religions is to foster affection and build friendship. He declared that he has many friends among Christians, Hindus, Jews and Moslems, as well as Buddhists. At the age of 81 he said he remains committed to working to promote human values and religious harmony and appealed to his listeners that if they think of him as their friend, they should do so too. Taking up the ‘Eight Verses for Training the Mind’, which is primarily a teaching about altruism, he said: “This is not just about accumulating knowledge but is rooted in taking refuge in the Three Jewels and generating the awakening mind. We can compare the usual four line verse for taking refuge to the words we say when offer our food – ‘To the Buddha the unsurpassed teacher, the Dharma, the unsurpassed refuge and the Sangha, the unsurpassed guides, I make this offering.’ When we say the Buddha is unsurpassed we don’t think of him as powerful like a creator, but as sharing with us the way to liberation, a way he has already gone. When we say the Dharma is unsurpassed we don’t just mean the scriptural teachings, but the realization that arises from implementing them in our minds. This refers to our training in morality, concentration and wisdom. Such a refuge enables us to eliminate the ignorance that is the root of suffering. We run headlong into suffering. Destroy it, as if it were our enemy. Neither do they transplant their own realization into others. Teaching the truth of suchness they liberate (beings). “In the Mahayana approach to taking refuge we take refuge until we attain the essence of enlightenment. The objective is to help all sentient beings alleviate their sufferings. The third line says, ‘through the merit of engaging in generosity and so forth, may I attain enlightenment for all beings.’ However, this is not only about merit but about wisdom too. If we investigate the ‘I’ who takes refuge, we find that our sense of a self that is intrinsically existent is without basis. It’s something we impose on the collection of body and mind. “Analysis is not something we accomplish quickly, but it is powerful and effective. It’s something I’ve undertaken for 60 years and it has a real effect. It undermines our misconception of self and in doing so it counters our disturbing emotions. The cognitive therapist Aaron Beck told me that when we are angry, the object of our anger seems wholly negative, but this is 90% mental projection. The Dalai Lama recommended adopting the Four Reliances: reliance on the teaching and not the teacher; reliance on the meaning and not merely the words; reliance on the definitive and not the interpretable meaning and reliance on noble wisdom and not on (ordinary) consciousness. Turning again to the Eight Verses, he said they were composed by Langri Thangpa a student of Potowa who belonged to the lineage of those who study the classic texts. The main point of the text, which is brief but effective, is the cultivation of altruism, which relates to the conventional awakening mind. The Dalai Lama was invited to lunch at the Overture Center for the Arts by the Chancellor of the University of Wisconsin at Madison, Rebecca Blank. After lunch, the Dalai Lama participated in a panel discussion which touched again on the importance of peace of mind and the interest that scientists are now taking in it. The Dalai Lama pointed out that what really destroys our peace of mind is our disturbing emotions. He commended a greater role for women leaders, suggesting that if the world’s almost 200 nations were led by women the world might be a safer place. He referred to encouraging scientific evidence that basic human nature is compassionate, which means that we can train ourselves further that way. He noted that corruption is a result of shortsightedness, low moral standards and greed. And while observing that real generosity occurs when there is no expectation of a reward, he reminded those listening of the importance of giving with respect for the recipient. He said that it is also possible to visualize being generous. He said the media have an important role to educate people about positive developments, which would involve taking a more balanced view of human activity and potential. As to what he would like scientists to study to contribute to creating a better world, he replied that they should accept that their knowledge remains limited and to approach their work with an open mind. He recalled warnings he received nearly 40 years ago to beware of science as a ‘killer of faith’. He overlooked this advice and entered into dialogue with scientists that in the course of time has been mutually beneficial and enriching. With his recent visit to Madison, the 14th Dalai Lama spoke again to a packed theater at the Overture Center. His message was at once simple and profound: World peace is developed from inner peace, and the foundation for both is love. To best serve as guardians of democracy, police must be more than peacekeepers, we must also be peacemakers. One calls for police to respond to and preserve peace while the other requires us to create and perpetuate peace. Both are necessary dimensions to the compassionate guardianship members of the Madison Police Department strive to effectuate every day. As the Dalai Lama reminds us, to do this work we must start by creating opportunities to foster inner peace. To this end MPD is poised to embark on a groundbreaking collaboration with Dr. Richie Davidson and his team of researchers from the Center for Healthy Minds here at the University of Wisconsin – Madison. Our officers may encounter dangerous and unpredictable critical incidents on any given day, and must also deal with the additional stressors of shift work, lost sleep, public criticism and increasing scrutiny. While many officers regularly incorporate a variety of individual wellness practices, and the Department has several support systems in place to promote officer wellness including our City Employee Assistance Program, Critical Incident Stress Management Program, Officer Involved Critical Incident Aftercare protocol and Peer Support Program, we continuously seek out opportunities to help improve officer well-being through proactive and preventative practices. This is a critical issue not just for our officers and their families, but for the Madison community as a whole. As reflected both in the Presidential Task Force on 21st Century Policing report as well as a recently released set of recommendations from a use of force task force stemming from the Dane County Law Enforcement and Leaders of Color Collaboration, the health and well-being of police officers is inextricably linked to the health and well-being of the communities they serve. Officers who are resilient in the face of stress and trauma will be happier, healthier, and more productive. They will have greater capacity to respond in an adaptive manner to critical incidents as well as non-traumatic daily interactions, and they will have the strength and resources to serve as effective guardians of this community. Officers train. We train a lot. And what Dr. Richie Davidson’s world-renowned research in the field of contemplative neuroscience tells us – much of which has included studying the Dalai Lama and other veteran practitioners of meditation – is that we can also train for well-being. In working with Dr. Davidson and his research team at the Center for Health Minds, we are exploring a pilot study designed to investigate the effects of Mindfulness-Based Resilience Training (MBRT) on police officer physical and mental well-being. Planning for this project is underway, and we are working hard to secure a source of funding. We are excited about this collaboration with the Center for Health Minds and anticipate that this pilot study will be but the first step in an ongoing partnership. It is our hope that this project may come to serve as a model for how police departments across the country can promote officer well-being, with potential cascading benefits throughout the department and for the communities we serve. 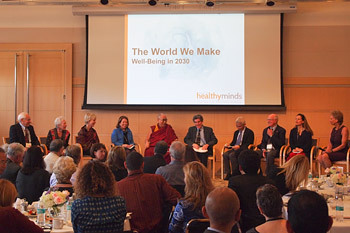 We are thankful to Dr. Davidson and the Center for Healthy Minds for the invitation and privilege to have heard the Dalai Lama speak here in Madison last week, and we look forward to the opportunity to partner around our shared commitment to cultivating peace. Prior to a discussion human rights at an event sponsored by the United Nations (UN) the Daili Lama met with journalists on March 11, 2016. Geneva, Switzerland, The Dalai Lama spoke of on the “Oneness of Humanity” and explained to the audience his three commitments. He recommended that education should emphasize the inner values of (1) warmheartedness, (2) tolerance and (3) forgiveness. He observed that although religion has been a source of happiness for thousands of years, sadly, today, it is becoming a source of hatred. 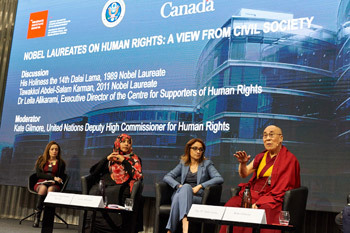 Later that day, the Dalai Lama participated in a discussion on the theme human rights in front of the Human Rights Council’s 31st session and members of the Tibetan community (above photos taken at UN in Geneva, Switzerland, March 11, by Olivier Adam ), with Nobel Laureates Tawakkol Abdel-Salam Karman and Leila Alikarami, and an Iranian lawyer and human rights activist representing Nobel Laureate Shirin Ebadi. “We are talking about the future of humanity,” the Dalai Lama said. “No matter how small our voice here may be, it is essential we speak up”, he said. “Sometimes people say all is well with the world, but they are mistaken. We are facing many problems. During my lifetime I have witnessed continual conflict and bloodshed in the course of which millions of people have been killed. We need to ask where we went wrong, what qualities we lack and why violations of human rights take place. Answering these questions and creating peace will require wisdom and compassion. He said those now causing trouble and disturbing peace in the world are also confident, but are insufficiently moved by basic human values. Therefore, if we are to create a more peaceful world in the future, we need to introduce warmheartedness and secular ethics into our general education system. The Dalai Lama said climate change and the ups and downs of the global economy are problems that affect us all. They are not confined to national boundaries. Focusing on secondary differences between us like race, religion, nationality and gender, stokes our inclination to divide people into ‘us’ and ‘them’, which easily becomes a basis for conflict. He stressed that if we remember the oneness of humanity and think of each other as brothers and sisters we can overcome that potential for violence.